North Texas Giving Day, the largest giving day in the nation powered by Communities Foundation of Texas, is back on September 14, 2017! In eight years, North Texas Giving Day has generated $156 million for the community. Learn more about some of the thousands of participating nonprofits here on BubbleLife from now until Giving Day. Read more about today's featured nonprofit, Frontiers of Flight Museum, below. Support STEM Education and Make a Difference! There are many STEM programs available. 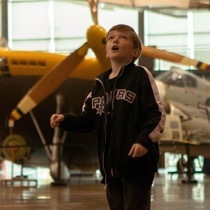 At the Frontiers of Flight Museum (FOFM), our acclaimed STEM curriculum focuses on aviation and space flight. 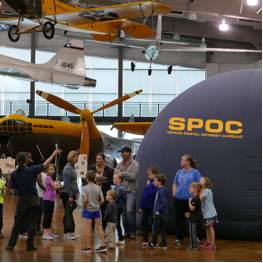 When you donate on North Texas Giving Day your gifts allow us to provide and expand the STEM and Aviation & Space History curriculum and programs to 18,000 kids and growing from PK to 12th grade throughout the metroplex. We teach kids the fundamentals and advanced skills in astronomy, physics, math, robotics, coding, the principles of flight, and much more at our FOFM Aviation & Space Camp, Spring Break Camp, school tours throughout the year, and through community outreach at schools and a plethora of events, as well as through our Youth Volunteer Program. We take kids to the Moon, through the Solar System, exploring the Milky Way, and back to Earth using the fascinating programs in our portable planetarium, SPOC, offering students a unique learning opportunity through an interactive 3D environment. Our Space Flight Gallery, anchored by the Apollo VII Command Module, will give students hands-on exhibits and learning stations that show the real technology and scientific theory as well as great artifacts from completed missions whose findings inspire our future space ventures. Launched in 2016 with the addition of SPOC, our Exploration Space Initiative is a multi-faceted expansion of our STEM programming that includes a major expansion of our Space Flight Gallery with new interactive learning stations and displays. Also in the plans is a Space Video Series that will stream online for use in any classroom – providing an innovative and effective means for educators to address and deliver curriculum that teaches about the past, present and future of space exploration. We will be reaching over 35,000 students and 95,000 visitors annually through our Exploration Space program and exhibits with your help! To donate to Frontiers of Flight Museum on September 14th, please click here. To find out more about North Texas Giving Day, please visit www.NorthTexasGivingDay.org.